Kitchen remodeling really brings how you use your kitchen to light. Quite literally! We need to know how you use your kitchen so we can help you create the best lighting possible. You may think that everyone uses their kitchen the same way, but that isn’t always the case. An aspiring chef needs all the bells and whistles where the average family of four only needs a well-designed and well-lit room to make food and enjoy family time. Let’s look specifically at kitchen lighting options. Pendant lighting is excellent for the kitchen island, a floating countertop, or a bar area. They allow you to highlight the specific area while also using the fixtures as a decorative focal point. Make sure to buy fixtures that you love, because you will see them every time you enter the kitchen. 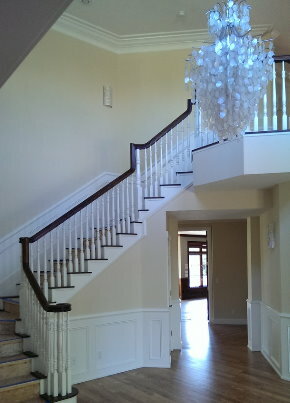 Recessed lighting is a great solution for the homeowner who prefers a nice, flat ceiling. Small canisters are sunk into the ceiling so that there is no obtrusive fixture hanging down. These provide plenty of ambient light for the average kitchen. Track lighting is very decorative and can be quite the centerpiece. It allows you to direct lighting in the directions you want it to go. You can use track lighting to highlight artwork and decor or as decorative ambient lighting for the room. Cool, clean, bright lighting is best for most parts of the kitchen. Pendant lighting can easily serve two purposes – ambient lighting or task lighting. Consider using lighting with a dimmer switch for the pendant lighting above the bar or eat-in kitchen island so it can be dimmed when you plan your next romantic dinner. Warm lighting is best reserved for the living room, den, and bedroom. The type of fixtures you choose for your new kitchen will be determined by several factors. The first factor, of course, is personal preference. If you simply love the way a specific fixture looks, let us know so we can design parts of your kitchen to make sure the fixture fits exactly as it should. The type of material and how it directs or spreads the light are also crucial factors in choosing light fixtures. Pendant lighting and recessed lighting, for example, are completely different types of lighting. The pendant would be completely visible whereas the recessed lighting is hidden, so the appearance doesn’t affect the overall appearance. 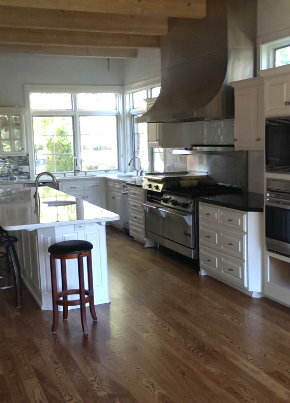 Give us a call if you’re interested in remodeling your kitchen with us and would like to schedule a consultation. We’ll take your kitchen-use habits into consideration and help you design and build the perfect custom kitchen for your individual needs.